Another luxury brand of the LVMH group has adopted Swaven’s brand commerce technology to add value to its marketing and to further increase its online sales. Givenchy’s fragrances were made shoppable on the brands’ website thanks to Swaven’s POP (Point Of Purchase) solution. The service is already available in the UK, US, Canada and France and four other countries will deploy it by this summer. This collaboration with Givenchy further strengthens Swaven’s position as the global partner of leading beauty groups. Indeed, more than 35 beauty & luxury brands have already chosen Swaven’s shoppable services in 14 countries. Following Kenzo’s worldwide deployment, Givenchy is the second brand of the LVMH group to opt for Swaven’s POP solution. L’Oréal, PUIG and COTY are also part of the company’s major references in this sector using the solution not only for websites but also for videos, banner ads, social media, chat and more. Swaven’s capacity to offer sophisticated and tailor-made solutions perfectly corresponds to beauty and luxury brands’ requirements in terms of efficiency, design and user-friendliness, all with an extreme easy and quick implementation process on a global level. 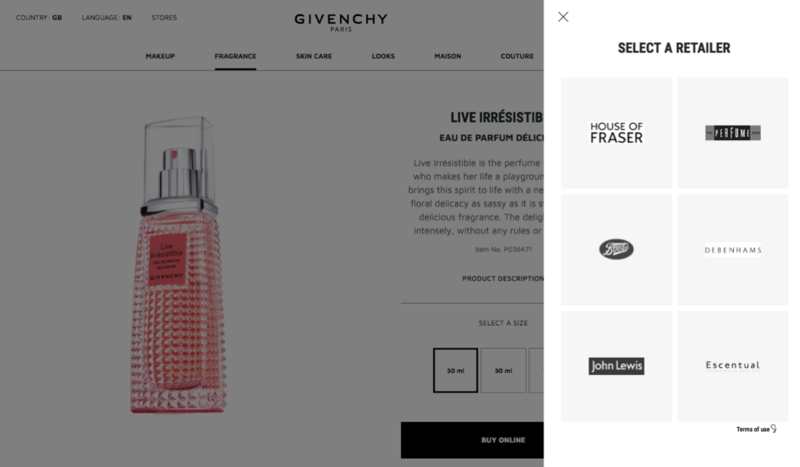 Thank’s to Swaven’s POP, Givenchy is now able to redirect its website visitors to purchase options directly from its product pages. In addition to information about each product, a “buy online” button is displayed next to it. Clicking on it triggers a pop-in, presenting a list of resellers who have the chosen product available. Each retailer is displayed alongside its logo containing a link to its shopping pages. This way, Givenchy lets the consumers easily choose where to buy its products, instead of forcing any single address. In one click, the shoppers get redirected to their preferred shops to finalise purchase, thus keeping them within the sales funnel. Swaven’s POP solutions have been developed for ultimate customisability and can be designed to fit in with a brand’s general identity or modified for specific campaigns. Aside from aspects such as colour, font, logo, and more, it is also possible to modify the layout in which the tool is displayed on the brand’s website. The distributor view, which displays several available retailers at once, can be arranged according to brands’ wishes, for example by ranking specific retailers higher up. The entirely customisable Call-To-Action button can be integrated either for each product or as a “sticky button” that follows the user when he/she scrolls down the page. Givenchy was very satisfied about Swaven’s capacity to adapt the design of the widget in line with the brand’s requirements. Deploying Swaven’s solution on their website allows brands to collect highly useful statistics on the shopper paths by acquisition channel. They can keep track of consumers’ choices regarding products and retailers and analyse which campaigns generated the potential leads and which products were finally most successful. Using this information, the brands are finally able to monitor and estimate the effectiveness of their marketing campaigns to adjust their marketing strategy and budgets accordingly in order to increase their ROI. Contact us for a demonstration of our solutions and how Swaven can help you enhance your brand marketing profitability whilst creating a modern and effective user experience for your customers.